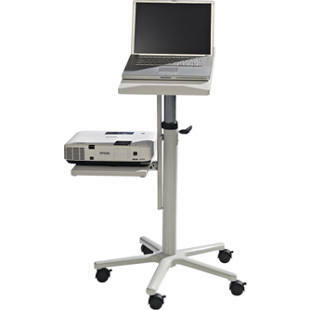 Lectern and projector trolley in one! 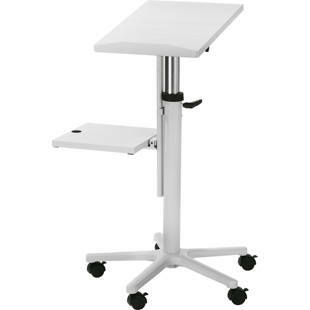 Telescopic column made of steel tubes, melamine coated panels, height adjustable from 750 – 1200 mm. 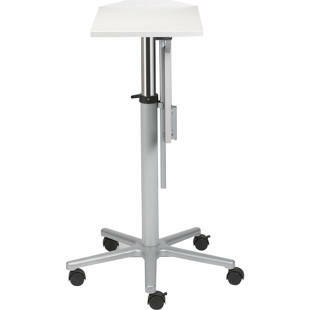 Tabletop WxD 350 x 500 mm, can be tilted forwards by 10°, max. load approx. 30 kg. Side panel WxD 300 x 300 mm, can be mounted on the right of left, max. load approx. 8 kg. Both panels are height adjustable in parallel, panel interval 390 mm. Five star base Ø 610 mm made of cast aluminium with 5 braked castors. Unfortunately, this product is no longer available. Possible alternatives can be found further down this page. This product can be found in 0 variants.